Interview with JOHN D. MacDONALD, by Ed Gorman. 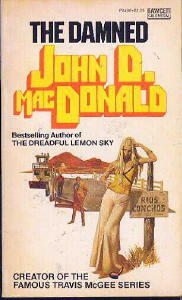 I interviewed John D. MacDonald three times over the years, twice for Mystery Scene. He generally hated giving interviews. I think this one was an exception. His wife was ill, and he was starting to experience health problems of his own. My impression of him was that he was neither humble nor arrogant. He took pride in his writing, but he viewed much of it as not working out quite as he’d hoped. He told me once that he sometimes judged his books by percentages. This book did 70% of what he’d hoped; that one did 80%. He was generally kind to other writers, notably Charles Williams whom he mentioned in two different interviews. He seemed to feel, as do I, that Williams should have broken out. My feeling was that Williams was too dark for the middle-class readers who flocked to John D. — which is funny because John D’s early Gold Medals and Dells were pretty damned grim. I think I’m borrowing something from Larry Block when I say that some reviewers, especially in Europe, thought he was tame by the lights of Jim Thompson and David Goodis. They didn’t grasp the spiritual violence of such novels as A Key To The Suite (about a sales convention) and Slam The Big Door (the hollowness of success). Most of us die little deaths except for the final big death. We lose jobs, mates, dignity. Key, for instance, charts the demise of several careers and at least two marriages in ways every bit as powerful and memorable as any shootout. The Damned proved that you are a born mainstream novelist. Do you recall the circumstances under which the book was written, and were you aware it was taking your career in a slightly new direction? I was not trying to fit books into market slots. I wrote The Damned because I knew the locale, and I was interested in what would happen if a lot of people got jammed up at the crossing. A lot of things would happen to them, and that is the definition of a story. While the critics have always talked about how Travis McGee puts rather helpless women back together, female characters such as Laurie in April Evil are very strong in their quiet ways. You seem to like your strong female characters better than the weaker ones – or is that me misreading? I think that most of us have a greater liking for strong and solid people than we have for the wimps of the world. With strong people you can tell where you stand. Nobody, of course, is too strong to ever be broken. And that is McGee’s forte, helping the strong broken ones mend. Soft Touch was an interesting variation on your early work. Here we had the resolute war veteran-intelligent, forceful, capable – so familiar in your early books ... yet here he goes bad. Your readers don’t seem to mention that book quite as often as some of your others, but it’s an almost flawless performance. Is it one of your personal favorites? 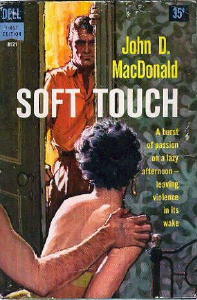 I think I would have a warmer feeling about Soft Touch had it not been made into a pretty sorry motion picture called MAN TRAP. I think the book worked fairly well, in that it almost did what I wanted it to. What was it like, as a young family man, to embark on the hazardous career of freelance writer? It was nervous, but not too bad. I had four months of terminal leave pay at lieutenant colonel rates starting in September of 1945, ending in January 1946. I wrote eight hundred thousand words of short stories in those four months, tried to keep thirty of them in the mail at all times, slept about six hours a night and lost twenty pounds. I finally had to break down and take a job, but then the stories began to sell. I was sustained by a kind of stubborn arrogance. Those bastards out there had bought one story “Interlude in India,” and I was going to force them to buy more by making every one of them better than the previous one. I had the nerves of a gambler and an understanding wife. What are some of your favorite memories of your early writing days? Every sale had a kind of iron satisfaction about it. “I showed you guys.” I remember standing in front of the downtown post office in Cuernavaca and opening a letter with $1,000 in it for “Louie Follows Me,” bought by Colliers. 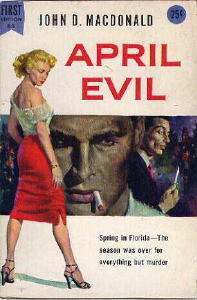 In late 1949 I wrote a long pulp novelette. My agent, Joe Shaw, asked me to expand it. I resisted, but complied. I hate puffing things. Cutting is fine. Everything can use cutting. But puffing creates fat. Gold Medal took it for their new line of originals. 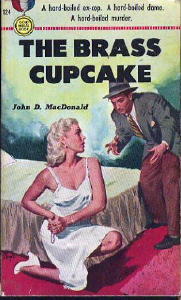 It was titled The Brass Cupcake. What are some of your least favorite memories of that time? Professionally, I do not recall any particularly bad memories. The book which just won’t jell. The editor who gets fired when you have half a book in his shop. The clown who was taking my old pulp stories and changing the point of view and selling them to Manhunt. I began to learn my trade in late 1945. Had I begun ten years later, I would never have had the chance to earn while learning. The short-story market was sliding into the pits. Luck is being born at the right time. I had an agent who kept me out of Hollywood despite some pretty offers. I was lucky to have a man so wise. I decided against doing a series character in 1952. I had no good reason. It was just a gut feeling. I didn't start McGee until 1964. By then I could avoid being trapped in the series. Saying no was the purest kind of luck. FOOTNOTE. Which writers of your generation, suspense or mainstream, do you feel have been undeservedly neglected? There are some, of course. Charles Williams comes to mind. I do not want to enumerate those who wrote too seldom or too short. Or who went into another line of work. That was their decision. Would you share with us some of the books you feel you’ve learned a great deal from, both as a man and a writer? The House Guests manages to portray an interesting family in a way that’s sweet without being treacly. One senses that your family has helped you, in a variety of ways, be the writer you are today. True? My family has given me the support one might expect. Approval, backup, affection, respect. The House Guests is also remarkable in one other way. You make the felines in your life assume almost human shape without resorting to any Disney tricks. I remember especially one of your lines: “A cat cannot abide being made to look ridiculous.” Do you still get great pleasure from cats? The present cats in residence are Bogie, an eighteen-pound male neuter tiger, and Canella (Cinnamon in Spanish), a spayed tabby. They are the same age, four, and I believe they are related. When you look back over the past thirty years of writing, do you have any major regrets? How did Travis McGee come into existence? At the request of Knox Burger, then at Fawcett, I attempted a series character. I took three shots at it to get one book with a character I could stay with. That was in 1964. 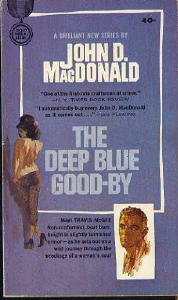 Once I had the first McGee book, The Deep Blue Goodbye, they held it up until I had finished two more, Nightmare in Pink and A Purple Place for Dying, then released one a month for three months. That launched the series. Do you find a series character confining? I do not find a series character confining. I do other kinds of books in between the McGee books. First-person fiction is restrictive only in that you can’t cheat. The viewpoint must be maintained with flawless precision. You can’t get into anyone else’s head. The whole world is colored by the prejudices and ignorances of your hero. Does Travis have any secrets we should know about? Will you describe a typical day for Travis when he’s eighty-five? Do you recall your mood while writing The End of the Night? It’s a much better book than In Cold Blood, yet it’s also more despairing than Capote’s work. The curious thing is that you dedicated it, rather cutely, to your cats. I remember that when I wrote The End of the Night I was very curious about the social and political effects of the mind-altering drugs. This was a new force in our arena at the time I wrote the book. At that time my cats, Roger and Geoffrey, had the habit of napping on my big work table. They scruffed up my pages and left pad marks. So I dedicated the book “To Roger and Geoffrey, who left their marks on the manuscript.” That sounds cute to you? How about the people who had no idea I owned cats? They thought I was talking about editors. Whom do you read for pleasure these days? I might as well tell you the titles of the books on my nightstand and on the table by the couch. Fadeaway – Rosen, Table Money – Breslin, Something about a Soldier – Willeford, Hugging the Shore – Updike, Blue Highways – Moon, Plumb– Gee, A Perfect Spy – Le Carre, It – King. Would you tell us a bit about any works-in-progress? In the fall there will be a book of letters called A Friendship, letters to and from Dan Rowan (Laugh-In) from 1967 to 1974. In the spring there will be a new edition in hardcover of Slam the Big Door, and a bit later, the twenty-second McGee, as yet untitled. Copyright © 1984 by Ed Gorman. Previously appeared in The Big Book of Noir, edited by Ed Gorman, Lee Server, and Martin H. Greenberg, Carroll & Graf, 1998. Reprinted by permission of the author. New introduction copyright © 2005 by Ed Gorman. FOOTNOTE. Nothing has caused more interest in this interview than the accusation JDM made about the unnamed writer who rewrote some of his early stories and submitted them to Manhunt. This is not the same incident, by the way, in which Dimitri Gat agreed that his second mystery, Nevsky’s Demon (Avon, 1983) paid too close an homage to MacDonald’s The Dreadful Lemon Sky. Gat’s book was recalled, and he was required to apologize.